There has been a lot of talk about the weather in our home lately. As winter makes an appearance Reece has been keenly interested in what Old Man Winter is up to. Questions about icicles, snowflakes, how good snowman making snow is made and so on. So many questions. And then just like that a wonderful e-book The Weather Watcher's Handbook from Dawn and Annie of Mudpuddles to Meteors landed in my inbox, perfect timing! 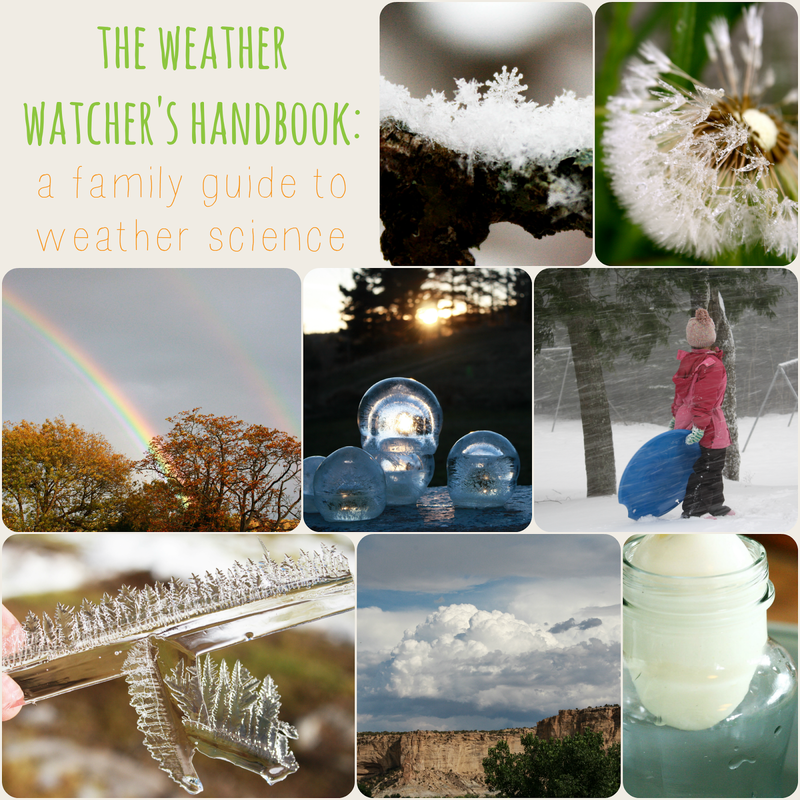 This is one amazing e-book filled with over 40 pages of fun information about weather science. Inside you will find information on the seasons, the water cycle, rainbows, wind, storms, ice and snow and more. I have to admit this cloud loving nature girl thoroughly enjoyed the section on clouds. Amazing. And since Dawn and Annie know how much our kiddos love to explore they have included ten hands on activities bringing all the information to life right in front of your little ones eyes. Dawn and Annie have generously offered one lucky Mothering with Mindfulness reader a copy of The Weather Watcher's Handbook...how exciting is that! To enter leave a comment below. I will randomly choose a winner on the evening of Friday November 29 and announce it in this post. Nenna "I´m so interested to read this book!" Congratulations Nenna, enjoy the book. And don't forget you can get your own copy right here if you would like to check it out. So worth it! This eBook would be perfect for Wilhem! Like Reece, he is memorized by the appearance of snow. How exciting!! I would love to explore the weather with this ebook and my kiddos! My name is Andrea. It wouldn't seem to let me use my wordpress credentials but I really wanted to leave a comment since this ebook is so exciting to me! I would love to explore the weather with the kiddos. This weather e-book would be perfect for my science-loving daughter!!!! Seems so so interesting! Oh I'd love to read it for sure. Thanks to them and to you for offering this giveaway! My grandson would love this! (He is panic-sticken during storms---and the midwest gets more than it's fair share!...and he is GLUED to his mom's phone radar at the very hint of inclement weather!) Maybe a more realistic view of what it's all about might be helpful!!! It sounds really interesting! Thank you for a chance! I´m so interested to read this book! What a wonderful give-away! My girls would love it, I'm sure. We would definitely love this book - the girls ask all kinds of questions and love looking things up themselves. What an interesting book! We are homeschooling and this would be a joy to read this year. My weather watchers would love this!